Delegates at a previous edition of GeoME. Industry experts from around the world are expected to discuss business opportunities and geosynthetics applications in various sectors when the seventh Geosynthetics Middle East (GeoME) conference and exhibition gets under way next month (November 16 and 17) in Abu Dhabi, UAE. 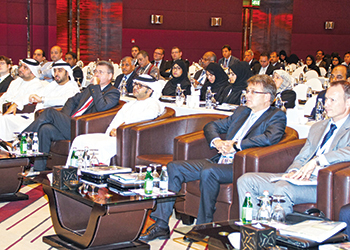 With more than 400 international industry experts having attended the previous edition, the conference has turned out to be the largest event on geosynthetics throughout the Middle East. The event is organised by SKZ German Plastics Center in partnership with BMC Gulf under the patronage of Abu Dhabi City Municipality. “Strategically located in Abu Dhabi, the GeoME 2015 provides regional and international investors, project leaders and technology providers, an unrivalled gateway to access the geosynthetics markets in the Middle East, African and the Asian Sub-continent,” said Irina Bender, GeoME conference director at SKZ headquarters in Würzburg Germany. “Over two days, international industry experts will exchange knowledge and build business partnerships on geosynthetics applications in infrastructure, transportation, oil and gas, water, waste and energy,” Bender added. The conference will be associated with a technical exhibition, where national and international companies will showcase their products and services in geosynthetics, geotextiles, geomembranes, waterproofing membranes, geosynthetic clay liners (GCL), geogrids, geonets, geocomposites, geofoam, geocells, geopipes, water management systems, leachate collection systems, irrigation solutions, erosion controls and many more. This year’s event will also include the first GeoME Awards to celebrate the achievements of industry leaders within the geosynthetics industry, recognising their outstanding performance in categories such as Best Geosynthetics Project, Best Geosynthetics Innovation and Technology, Best Geosynthetics CSR, HSE, QA/QC Project or Initiative. Also for the first time, Geosynthetics Middle East will feature SKZ-certified workshops and short courses on topics such as: Standardisation of Geosynthetics, Welding of Geomembranes, Classification of Geotextile Separation Layers, and The Future of Polymers in Construction, among others.